(73) Leon Guy Austen M2/052240 Royal Army Service Corps - Genealogists' Forum - We have branches everywhere! 73rd of the Old Boys of St Wilfrid's School, Haywards Heath to lose his life in WW1. Leon was born in 1881 in Haywards Heath, Sussex, one of thirteen children born to George and Harriet Austen. In 1871 the Austens had lived in Kents Road in Haywards Heath where George was a boot & shoemaker, the family had moved round the corner to Triangle Road by 1881 and George had 2 employees, but by 1901 he was running The Heath pub which is still there at the corner of Triangle Road and Sussex Road. In 1901 Leon was working for his father as a barman at the family pub. In 1904 he married Laura Louise Butler and they lived at 4 Triangle Road, and had 3 children by 1911, but the family were struck by tragedy in 1913 when Laura died. In spite of this Leon enlisted early in the war and he went to France on 25 March 1915 but was ill with trench fever and heart problems and brought back to England. He died at St George’s Hospital, London on 3rd November 1918 and is buried in Haywards Heath Cemetery. His mother died in December of the same year and had not attended Leon’s funeral, she was buried in the same grave, as was his father ten years later. £40 19s 6d of his effects was paid to his eldest brother George on 24th October 1919 and a War Gratuity of £17 on 5th February 1920. This sad event occurred on Sunday morning, at King George’s Hospital, London. The deceased soldier, who was in the Mechanical Transport, was the fourth son of Mr and Mrs George Austen, of the Heath Hotel. He joined up early in the war and served three years in France. While out there he had trench fever and heart trouble and was invalided home. For three months he was treated in Manchester Hospital, and was then able to resume duty, but only for a short time. Falling ill again he was sent to the King George’s hospital and was here six weeks. His end was very peaceful. His age was 38. His wife died three years ago leaving him with three children, their ages are 13, 11 and 8 years. The funeral has been fixed for Friday, at 2.30pm at the Cemetery at Haywards Heath. 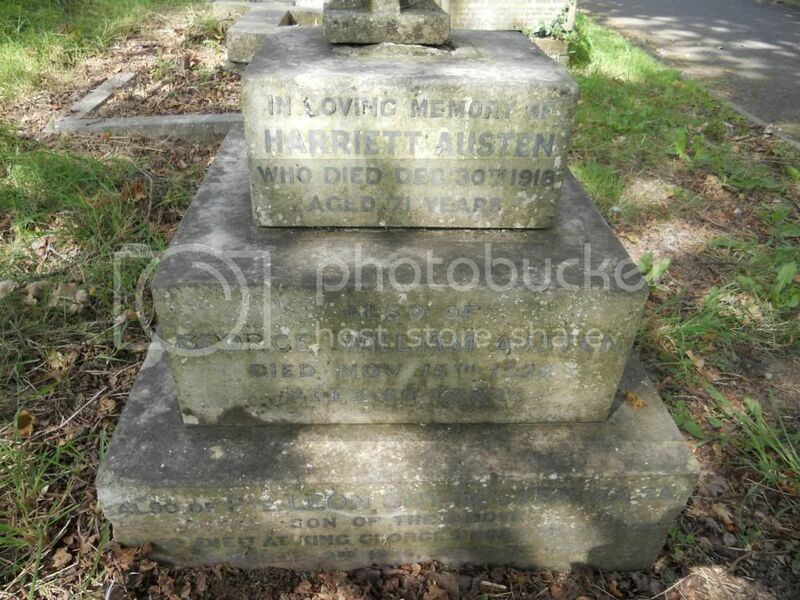 Amid the quiet stillness of a bright autumn afternoon – it was Friday – the body was committed to the grave of Private LG Austen, fourth son of Mr and Mrs G Austen of the Heath Hotel. As a tribute of respect blinds were drawn at many houses in Sussex Road and also in New England Road, it being at the Church of the Presentation in the latter road that the first part of the funeral service was conducted, the officiating clergyman being the Rev HE WARD. The chief mourners were Mr G Austen (father), Mr GW Austen, Private Sidney Austen, Captain FH Austen and Private Cecil Austen (brothers), Mrs Gasson and Mrs Collins (sisters), Mr S Gasson (brother in law), Mrs S Austen (sister in law), Miss Dixon and Mrs Smith. At the church, or at the cemetery, we noted Rev Father Hopper, Mrs and Miss Berry, Mrs Farncombe, Mrs Clements, Mrs Hampton, Mrs Duff Kelman, Mrs Skinner, Mrs J Pattenden, Miss Grace Paxton, Mrs Sayers, Mr H Field, Mrs FA Francis, Mrs Jeffrey, Miss Jeffrey, Mrs Knight, Mrs Hounsell, Mrs Woodland, Mrs J Payne, Mrs Marchant, Mrs Mann, Mrs Ellsey, Mrs Ellsey, Mrs Kimber, Mr Pierce, Mrs Cottingham, Miss Edwards and many others. There were many handsome floral tributes, the contributors being Mother and Dad; Bess; “To dear Dad, with love from Leon, Dorothy and Leslie”; Daise and Cecil; Puss and Hugh; Li, George, May and little Freda; Ada; Syd, Nance, Sylvia and Phyllis; Nance, Will and children; Jennie , Sam and Stella; Gertie and Wallie; Jim and Sadie; Edna; Tom; Mrs and Mrs Smith; Mr and Mrs Trigg; Mr, Mrs and Miss Deadman; Mr and Mrs W Berry and Mr and Mrs Percy Prince.